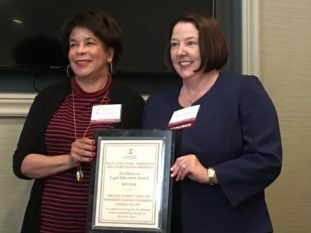 Professor Wendy Vaughn (right) accepts the 2018 ISBA Excellence in Legal Education Award presented to the NIU Law Civil Justice Clinic. The Northern Illinois University College of Law’s Civil Justice Clinic was honored by the Illinois State Bar Association with its 2018 Excellence in Legal Education Award. Established by the ISBA’s Committee on Legal Education, Admissions and Competence, this annual award recognizes a law school program that serves as an example of excellence in the practice of law; demonstrates records of exceptional advocacy, leadership and dedication; and significantly advances the cause of access to quality legal representation. “It is a tremendous honor for the NIU Law Civil Justice Clinic to be recognized by the Illinois State Bar Association with the Excellence in Legal Education Award,” said Clinical Associate Professor Wendy Vaughn, who has taught the Clinic since its creation in 2012. “Our students and post-graduate legal fellows develop critical legal skills while serving the needs of clients who have experienced trauma and who fear for their safety and their children’s safety on a daily basis,” she added. Under Professor Vaughn’s direction, students in the Civil Justice Clinic provide holistic legal services to clients by drafting estate-planning documents and counseling elderly adults, as well as by litigating order of protection cases for survivors of intimate partner violence and sexual assault. In addition to providing representation to individual clients, the Clinic collaborates closely with community agencies and advocates for systemic changes that increase access to justice, supportive services, and critical resources for its clients. The Civil Justice Clinic is part of NIU College of Law’s Zeke Giorgi Legal Clinic in Rockford, Illinois. The Zeke Giorgi Legal Clinic provides hands-on learning opportunities for law students to advocate on behalf of clients and has delivered free legal services to residents of Winnebago County for over fifteen years.